Greetings from The 88 Project! We are bringing you highlights of the news, analysis, and actions regarding human rights and civil society in Vietnam during the weeks of December 25-31 and January 1-7. Nine people were arrested and sentenced to between three and fourteen years in prison for distributing leaflets. Authorities have ended their investigations into at least six members of the Brotherhood for Democracy, though another man with alleged ties to the group, former prisoner of conscience Vu Hung, was arrested this week. The UN Working Group on Arbitrary Detention has deemed Can Thi Theu and Tran Thi Nga’s detentions arbitrary. Luu Van Vinh is struggling from worsening eyesight and death threats in pre-trial detention. Check out the end of the year report from Front Line Defenders about activists at risk, featuring a section on Vietnam, as well as news about Vietnam’s latest cybersecurity moves and freedom of religion. In case you missed it, read our update on Ho Van Hai, whose charges are still unknown more than a year after his arrest. Take action for the Brotherhood for Democracy members who are awaiting trial. Finally, we are pleased to unveil our latest initiative — a searchable database of prisoners of conscience in Vietnam. 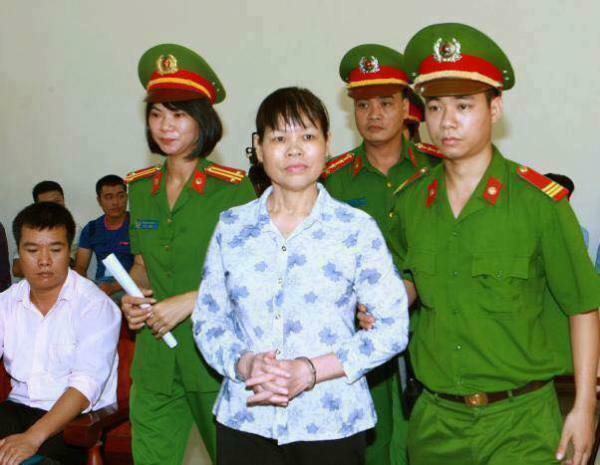 On December 28, nine people were sentenced to between three and fourteen years prison under Articles 88 and 79 in Binh Dinh for printing and distributing leaflets. The leaflets are said to have contained anti-Communist messages and to have stemmed from an overseas connection. The UN Working Group on Arbitrary Detention has released two opinions deeming the arrests and detentions of land rights activist Can Thi Theu and blogger Tran Thi Nga as arbitrary. The opinions call for swift remedies of the alleged violations of international law in their cases. The opinions condemn the lack of verifiable information about Theu’s health treatment in prison and the harassment of Tran Thi Nga’s young children. Theu is very active in the movement against land grabs in Duong Noi and is serving a twenty-month sentence for “disturbing public order.” Blogger Nga is serving a nine-year sentence under Article 88. On December 27, nearly a year after her initial arrest, Nga was finally able to meet with her two young children, though they were still divided by a glass screen. Her appeal of her sentence was denied on December 22. In December, authorities announced they finished investigations into several members of the Brotherhood for Democracy, a group founded by lawyer Nguyen Van Dai that was targeted with harassment and arrests during much of 2017. Authorities have recommended that members Nguyen Trung Ton, Pham Van Troi, Nguyen Bac Truyen, Truong Minh Duc, and Dai and his colleague Le Thu Ha, be prosecuted. Dai and Ha have been imprisoned since December 2015. It appears that authorities may be employing a host of tactics to stall defense meetings and communications for Dai. Luu Van Vinh has faced nearly constant death threats from his cellmate, but authorities have denied his request for a cell transfer; they have also denied Vinh glasses sent from his family. Vinh, a handyman who has participated in protests regarding maritime sovereignty and the Formosa environmental disaster, has been in pre-trial detention since November 2016; he is charged under Article 79. Authorities have arrested former prisoner of conscience Vu Hung and beat him in custody. Hung, a teacher, was arrested on January 4 while eating lunch in Hanoi. It has recently been disclosed that Hung is member of the Brotherhood for Democracy. Police arrested Protestant Pastor Doan Van Dien for unknown reasons on December 24; he is still being detained as of January 4. His son, Doan Huy Chuong (above, left), believes the arrest is a ploy to actually arrest him. Chuong is also a former prisoner of conscience and a leader in the Viet Labor Movement. Musician and artist Mai Khoi has been suffering increasing levels of harassment as she increases her activism and outreach. In March 2016, she made international headlines by becoming the first Vietnamese celebrity in history to nominate herself to Vietnam’s National Assembly on a pro-democracy platform. Though her candidacy was defeated, she continued establishing herself as a dissident musician, staging concerts and even meeting with President Obama. She again became the focus of international attention by protesting President Trump during his visit to Vietnam in November. During the past two years, she has been evicted multiple times from her homes, her concerts have been raided, and she has been detained by the police. Nevertheless, she continues pursuing her musical activism, which includes recording new albums and organizing new performances. Read Mai Khoi’s full profile here and please contact us if you could offer assistance to this activist at risk. Front Line Defenders highlighted Vietnam in its “Annual Report on Human Rights Defenders at Risk in 2017,” saying that “Vietnamese bloggers, academics and citizen journalists who have been working for years to push forward a human rights agenda were targeted in a systematic campaign in 2017.” Read the full report, here. Over a year after being arrested, there is a new update on the situation of blogger Ho Van Hai (a.k.a. Dr. Ho Hai) in prison. He was transferred in early December to a new, harsher prison facility, which is taking a toll on his health. He is not receiving proper amounts of food or medication. Little information can be found regarding the status of his pre-trial investigation. We are excited to announce the impending launch of our searchable database of prisoners of conscience in Vietnam! The database will allow users to search prisoner profiles using such criteria as type of activism, gender, and types of charges, among other items. It will be updated regularly with the latest news on trials, releases, and health conditions and will feature detailed English profiles for many prisoners. Stay tuned for the launch!